Parimatch is a traditional and international bookmaker company, which operates on the territory of Russia, Belarus, Georgia and Moldova. It is owned by Pari-Match N.V. The bookie also provides an online platform for many players worldwide. Parimatch was found in 1994 and quickly became one of the leading online betting providers in Russian and the neighbouring countries. Until this day, the bookmaker continues to develop and expand its business by quickly becoming competitive with the world’s best in the gambling industry. The website was launched for the first time in 2000 and till this day is fully operational for gamblers across many countries in Europe and Asia. However, players from the US are not accepted. As many other gambling companies, Parimatch is under the jurisdiction of Curacao. The headquarters are stationed at Dr. M.J. Hugenholtzweg Z/N UTS Gebouw, Curacao. In 2015, this enterprise has registered more than 1500 employees. This respected and well-regarded bookmaker participates in various important campaigns. For the season 2015 – 2016 Parimatch was the main sponsor of the Premier Championship League of Ukraine. The tournament itself got a nickname “League Parimatch”. The company was also the winner of the Betting Awards 2015, which took place at the Russian Gaming Week 2015. 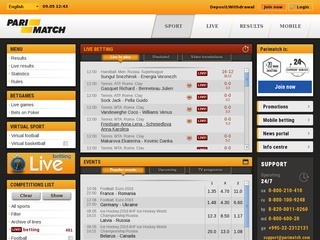 Parimatch offers almost all of the well-known sports markets. With more than 20 unique sports offerings, the traditional online bookie satisfies even the most pretentious tastes. On top of the various sports betting opportunities, the gambling giant also provides an extensive access to other markets, such as celebrities, awards and entertainment. For those who like to bet in real time, we have good news – the bookmaker supports it. Unfortunately, live streaming is still not part of the service. Gamblers can also take advantage of the mobile betting application, which is quite intuitive and well designed. A detailed history for every wager made is presented anytime for clients who like to review their gaming and develop their strategies. For those who like to taste different kind of gambling experience, there are poker rooms, live casino and numerous other games available. There are great choice for the fans of roulette, blackjack, various slot games and other opportunities. The odds are surely not the best in the branch, but they will satisfy the regular sports betting player. All odds are displayed in EU format and the overall betting margin calculated is 5.4%. 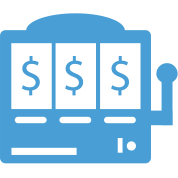 As a serious and responsible online betting company, Parimatch offers very detailed and well-structured information about the odds. Every bet type on every match has its odds value. Betting opportunities start from $1 as the lowest boundary for each and every sport with a limit that may vary. Maximum winnings are set to $200 000 per bet, which is quite generous. We can’t miss the most popular game of all and namely football. When we talk about football betting, there is a wide spectrum of possibilities. Bet types variations are quite extended and players can enjoy the standard 1X2, Correct Score, Half/Full Time, Under/Over, Number of Goals, Add. Total, Add. Handicaps and other. Complicated betting systems and strategies are also available. One of the most popular schemes is Parlay that allow more than one wager on different sports events. The security level ensured by Parimatch is high and customers can rest assured that their sensitive data and privacy is perfectly safe and secure. All connections to the website are encrypted via SSL with the certificate from Thawte. There are no international fair gaming organisations to regulate this online bookie, but its reputation is solid which is more than enough. Customers will be delighted to know that Parimatch operates a large support department, which is available 24/7/365. The staff is highly trained and very polite with even the rudest clients. Every registered user is free to contact them on the hot telephone line, via email and through the live chatting system. Parimatch’s representatives will answer your questions and issues in various languages. Deposits are instant and free of charge, but some of them have a minimum amount set up. It’s €10 for credit cards and $20 for online banking transfers. Any other payment methods are free of any minimal requirements or limits. Withdraws are also free of charge and limits, except Neteller that allows no more than €5 000 in one transaction. The usual waiting time for cash out may vary from 15 min to even six days for bank transfers. Minimum amounts for withdraws goes the same as the depositing requirements. 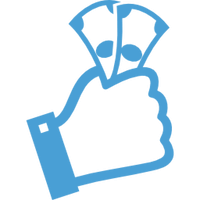 Untypically for such a large online gambling provider, Parimatch offers 25 USD for first deposit as a welcoming bonus. They are completely absent of any hot deals and bonuses for sports betting. 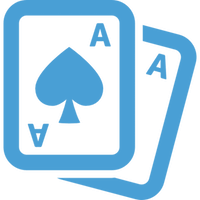 Only their casino and poker platforms support different promotions for new and existing players. There is a 100% Casino bonus up to $100 and 200% Poker bonus up to $200. Sports betting enthusiasts might be in shock now, but the missing bonuses are not a reason to cast aside Parimatch. The online bookmaker is still a great option for the traditional sports gamblers who like to bet with serious companies in the branch.